Ford's dividend makes its stock tempting -- and Ford has a plan to keep it that way. With a dividend yield around 6.6%, Ford Motor Company's (NYSE:F) stock is showing up on the radar screens of investors looking for income. 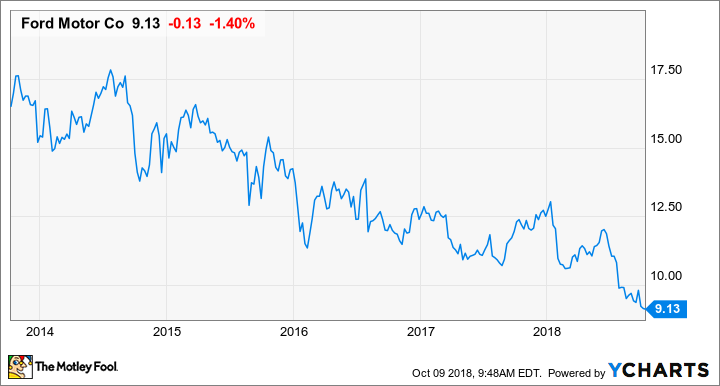 But as most investors know, a high dividend yield can be a warning sign: The stock might be cheap because the company is in some trouble -- and if so, a dividend cut could be on the way. Ford's stock fell to a six-year low on Tuesday, closing under $9 for the first time since 2012. The company isn't in dire straits by any means, but its stock is cheap right now -- arguably for good reasons. Does that mean a dividend cut is on the way? Let's look closer. Ford's super-profitable pickups bring in a lot of cash. But Ford expects to have cash flowing from another source soon, one that can fund most of its dividend. Image source: Ford Motor Company. 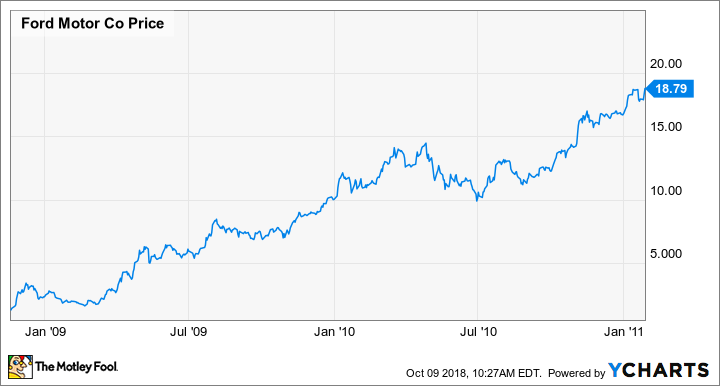 Coming out of the last recession, Ford's stock was a shining performer, rising from a low of $1.26 on one particularly awful day in November of 2008 to $18.79 in January of 2011. That made it a monster 15-bagger if you timed it just right and still an 8- to 9-bagger if your timing was even in the general ballpark. But over the last five years, Ford's share price chart has looked a lot different. Right now, Ford is trading at about 5.3 times earnings, far from the roughly 10 times earnings we'd expect of a healthy automaker in a strong market. What happened here? After posting huge losses at the trough of the 2008–2009 economic crisis, Ford's pretax profit rose to a record $10.8 billion in 2015. While Ford is still solidly profitable, its profits dropped in both 2016 and 2017, and Ford expects them to drop again in 2018. That doesn't mean Ford is going down the tubes, of course. It suggests that it's late in the cycle: While nobody knows when the next recession will arrive, it's very likely that we're closer to the next recession than we are to the last one. That means it may be a while before Ford can show the kind of earnings growth that will drive its stock price significantly higher. What's more, Ford is undergoing some restructuring right now, making changes that it expects will boost its operating margins significantly in time. But in the near term, those changes will eat some cash: Ford expects its restructuring effort to cost about $11 billion over the next three to five years. Add it all up, and it's easy to conclude that Ford is likely to cut its dividend. But is it? Absolutely not, said Ford's chief financial officer, Bob Shanks, when I asked him about a dividend cut back in August. Shanks told me that Ford's long-standing plan to continue dividend payments at current levels "through the cycle" -- that is, through a recession -- is still operative, in part because Ford is determined to show investors that they can rely on its dividend payments. But Ford expects to have no trouble funding its dividend in the meantime. Shanks pointed out that while its cash flow from auto sales (particularly in China and Europe) has fallen, its captive-financing arm, Ford Credit, will soon make up much of the difference. Ford Credit has been very profitable in recent years, but Ford had been reinvesting most of those profits in the unit's growth. Shanks said that it's now big enough that Ford has decided to cap its receivables. That means that the cash that Ford had been reinvesting in Ford Credit will now be available to the company -- and that cash flow alone will be enough to fund about 70% of the dividend. Nothing in investing is 100% certain, of course. But when we look closely at Ford's situation and consider the preparations it has made to pay dividends at current levels through the cycle, it looks like a solid bet. I own Ford stock, and I have no plans to sell. I think investors who jump in at current levels with a plan to hold for several years, reinvesting dividends along the way, could find themselves with a nice profit as the next recovery gathers steam.